This recipe took many attempts before perfecting. I started out with a recipe that was pretty good but needed some adjustments. It called for oil and shortening as the base. I didn't like the oil and used butter in place of it. It didn't call for sour cream, but I knew this would be needed. Too much sour cream made it bready. Too little or none made it crisp. After getting that right I played around with the sugar. A mix of powdered, white, and brown was the winner. Give them a try. 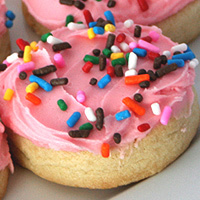 They are delicious, soft all the way through, but still maintain the delicate crumb of a cookie! In a medium bowl stir flour, salt, baking soda, and cream of tartar. Set aside. 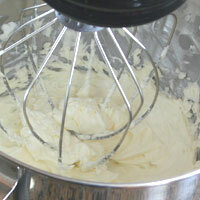 With the wire wisk of an electric mixer cream the butter, shortening, and sour cream until light and fluffy 3-4 minutes. Add the sugar, brown sugar, and powdered sugar. Beat another 2-3 minutes. Add the egg and vanilla, beat until incorporated. Brown sugar adds more flavor, and softens the cookie a bit. You can substitute an equal amount of white sugar if you don't have brown. Switch to the paddle attachment and add the dry mixture. Mix until the flour is just incorporated. The dough will be quite soft. Refrigerate 30 minutes. 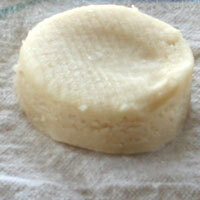 This will make it easier to roll out, and will require less additional flour to shape. Lightly flour the work surface or flour a canvas mat. A canvas baking mat and rolling pin sleeve are wonderful for soft rolls, pie crusts, sugar cookies, and many other soft doughs. 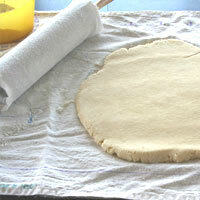 You can flour them generously and the excess flour works into the mat and the sleeve leaving the dough soft. 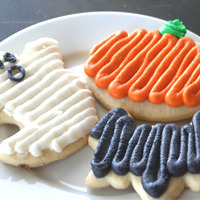 You can get them for $10 on http://www.thebakersplace.com/pastrymat.html. Rolling these out 1/2 inch thick, may seem a bit thick, but they are best this way. They will bake soft all the way through. 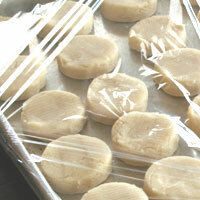 Place on a cookie sheet, cover in plastic wrap and refrigerate 20-30 minutes. 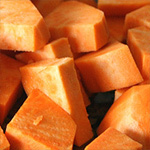 You can freeze them at this point up to 4 months, or refrigerate them up to 3 days. 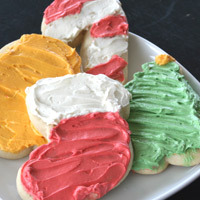 Place 12 cookies a few inches apart on a jellyroll pan or large cookie sheet. I like to use a small biscuit cutter. The dough freezes well, so I use them for multiple holidays without fussing over different shapes. I just use different colors of frosting and sprinkles. Bake at 375 8-10 minutes. They should be crackly on top, but not browning. Remove to a cooling rack. Frost when completely cooled. Too much flour- Too much flour will ruin them. They will be dry and hard. 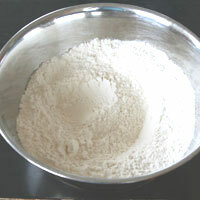 Too little flour- If there is not enough flour, they will spread too much when baked. 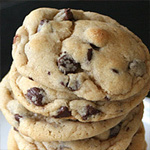 Overbaking- The cookies may not look done when you pull them out, but don't let them brown or they will not be as soft. 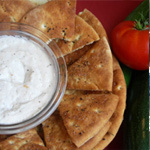 Too much sour cream- As I experimented, the addition of sour cream helped soften them. Too much sour cream however really cut in on the flavor and made them too pliable. This recipe is a great balance of softness and flavor. 1. In a medium bowl stir flour, salt, baking soda, and cream of tartar. Set aside. 2. 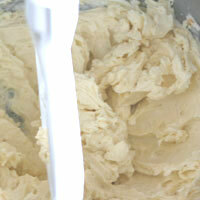 With the wire wisk of an electric mixer cream the butter, shortening, and sour cream until light and fluffy 3-4 minutes. Add the sugar, (1)brown sugar, and powdered sugar. Beat another 2-3 minutes. Add the egg and vanilla, beat until incorporated. 3. Switch to the paddle attachment and add the dry mixture. 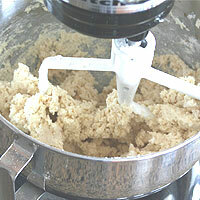 Mix until the flour is just incorporated. The dough will be quite soft. Refrigerate 30 minutes. 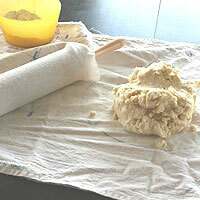 This will make it easier to roll out, and will require less additional flour to shape. 4. Lightly flour the work surface or flour a (2)canvas mat. Roll out (3)1/2 inch thick. Cut into desired (4)shapes. 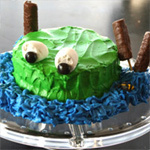 Place on a cookie sheet, cover in plastic wrap and refrigerate 20-30 minutes. You can freeze them at this point up to 4 months, or refrigerate them up to 3 days. 5. 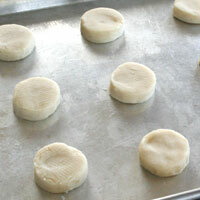 Place 12 cookies a few inches apart on a jellyroll pan or large cookie sheet. Bake at 375 8-10 minutes. They should be crackly on top, but not browning. Remove to a cooling rack. Frost when completely cooled. 1. Brown sugar adds more flavor, and softens the cookie a bit. You can substitute an equal amount of white sugar if you don't have brown. 2. A canvas baking mat and rolling pin sleeve are wonderful for soft rolls, pie crusts, sugar cookies, and many other soft doughs. 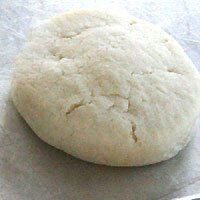 You can flour them generously and the excess flour works into the mat and the sleeve leaving the dough soft. You can get them for $10 on http://www.thebakersplace.com/pastrymat.html. 3. Rolling these out 1/2 inch thick, may seem a bit thick, but they are best this way. They will bake soft all the way through. 4. I like to use a small biscuit cutter. The dough freezes well, so I use them for multiple holidays without fussing over different shapes.